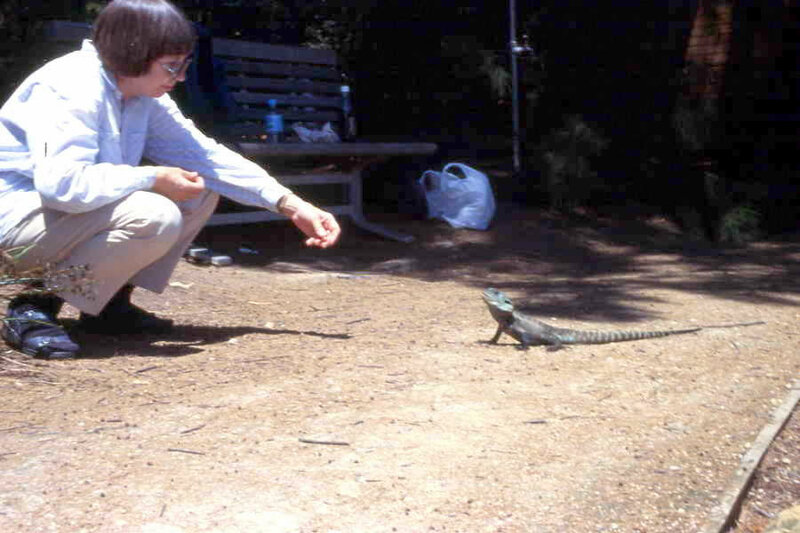 Australia has a spectacular array of reptile species and in 2000 Roger Avery and I had the opportunity to research the thermal ecology of the eastern water dragon Physignathus lesueurii at Canberra, ACT. 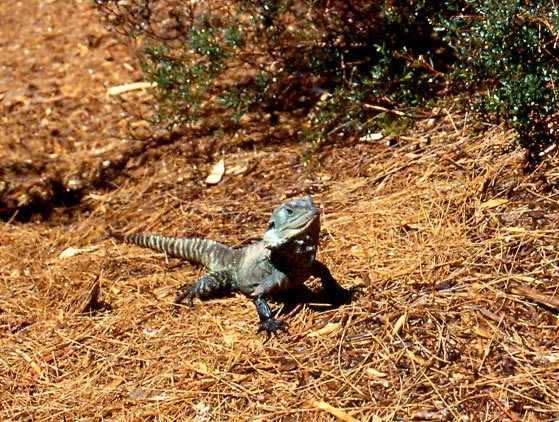 This is a large agamid lizard common across the eastern seaboard of Australia. The research group also included Eleanor Weir from Bristol University. 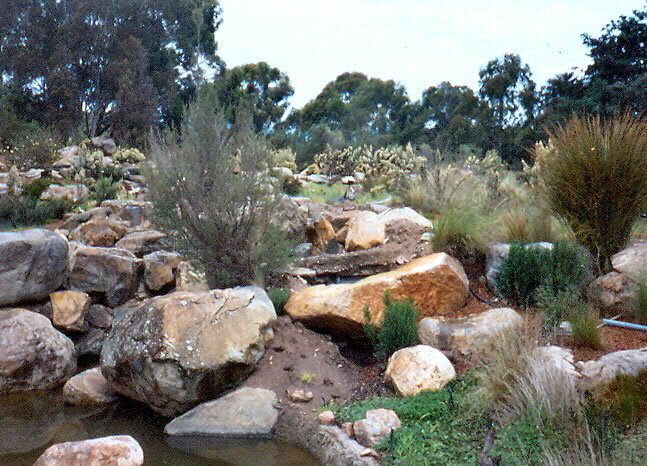 This photograph shows part of the study area at the Australian National Botanical Gardens situated on the lower slopes of Black Mountain, which is adjacent to natural forest. The water dragons were common and used to human contact, which made gathering data easier. In thermoregulatory terms the area is what is known as a low cost thermal environment. This means there is easy access to sunny areas to elevate body temperatures and abundant shade to cool. Operative temperatures during the hottest parts of the day reached 60˚C during November – December. An indication of how close you could get to a dragon can be seen in this photograph, which shows Avril Avery feeding a dragon. A story from Greg Sattler, the chief ranger on the site, was of one dragon that was injured by a car that severely affected its ability to walk and hence secure food. The lizard survived, apparently for many years, by turning up at the gardens café and feeding on scraps from the visitors! The core of the research examined the way different size classes of lizards respond behaviourally to changes in environmental temperatures. For instance, alpha males are territorial and defend areas that may include several females. This potentially produces a conflict between thermoregulatory behaviour and territory defense. We measured the changing amount of heat that was available in the environment using copper cylinders (defined as operative temperatures) to represent hypothetical non-thermoregulating reptiles and monitored the corresponding changes in the behaviour of lizards from different size classes (pdf 58). which gives the proportion of operative temperatures To in either full sunshine, dappled sunshine or full shade at any time interval t that are greater than Tthresh. Tthresh the less time in general the lizards can spend in these areas. The response of real lizards showed good agreement with the predictions of the equation but less so in alpha males (see pdf). Therefore, although movement in open sunlit areas is constrained, areas in dappled sunlight and shaded areas probably had no thermal impact on the lizards in terms of heat load constraints. A short film of the fieldwork, which also shows the operative models used, can be found here and a pdf of the research here. Two alpha male water dragons held territories that each included two ponds. Most of the egg-laying sites and female lizards were in the territory of the lizard dominating the bottom pond (shown on the left) and was presumably a better territory. At around mid-afternoon each day the lizard from top pond (photograph above right) challenged the resident bottom pond lizard but was always driven off. So why the daily challenge, which he seemed always certain to lose? It may have been due to the potential of injury on the lizard at the bottom pond, which could limit his ability to defend the territory or a predator could have removed him altogether. The easiest way to find this out in a visually constrained environment, where alpha males may not be able to see each other, is by entering bottom pond territory and presenting a daily challenge. Water dragon egg-laying sites (above). We recorded egg-laying during December in Canberra with apparently more than one female using the same nest site. 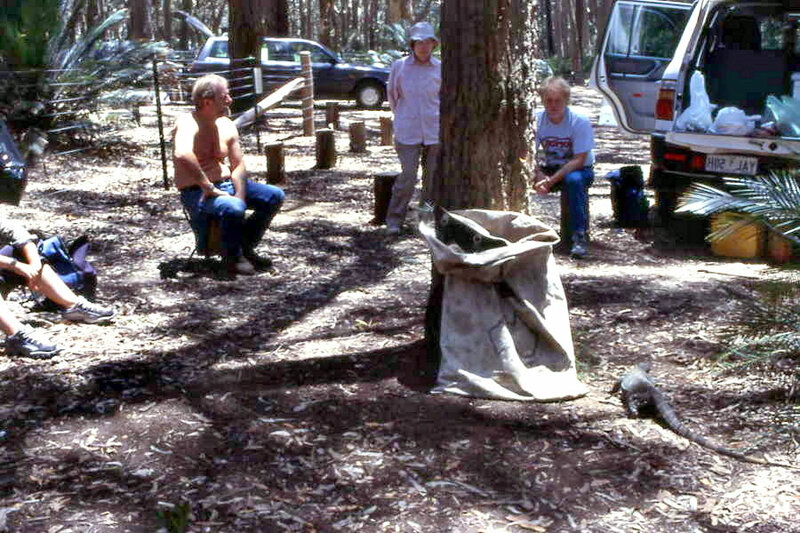 The nests became evident after heavy rain when the loose sand compressed, indicated by depressions in the soil in the lower middle of the photograph (pdf 41). 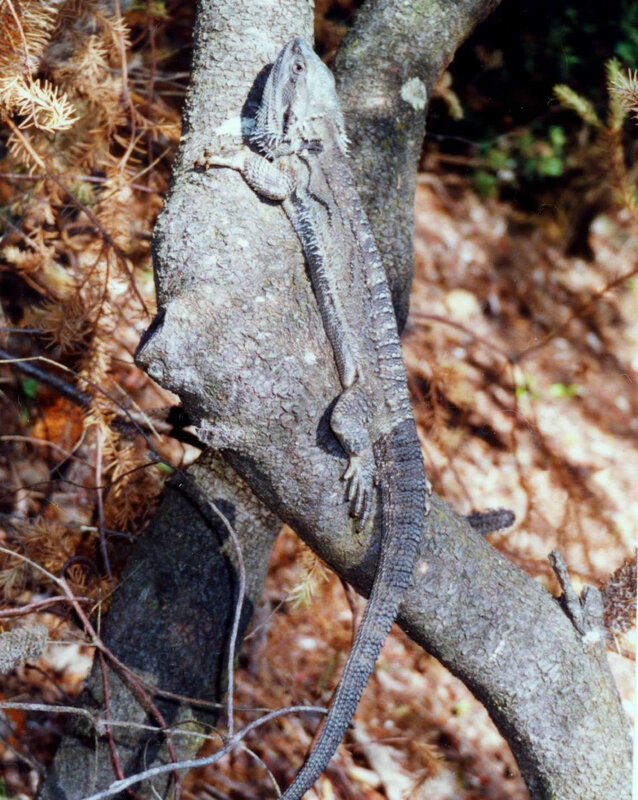 Another agamid found in the surrounding natural woodland, was the eastern bearded dragon Pogona barbatus (above left). This species can grow to 60cm - about the same size as a water dragon and, similar to the water dragons, the males are territorial. They employ crypsis (remaining immobile when approached) to avoid detection. They eat small animals and occasionally vegetation. The photograph, above right, shows a visiting (to our study site) eastern brown snake (Pseudonaja textilus) a highly toxic elapid snake. 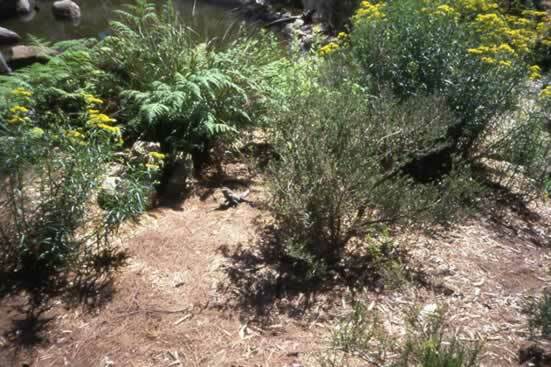 A potential prey, a juvenile water dragon, can just be seen in the top left corner of the photograph. 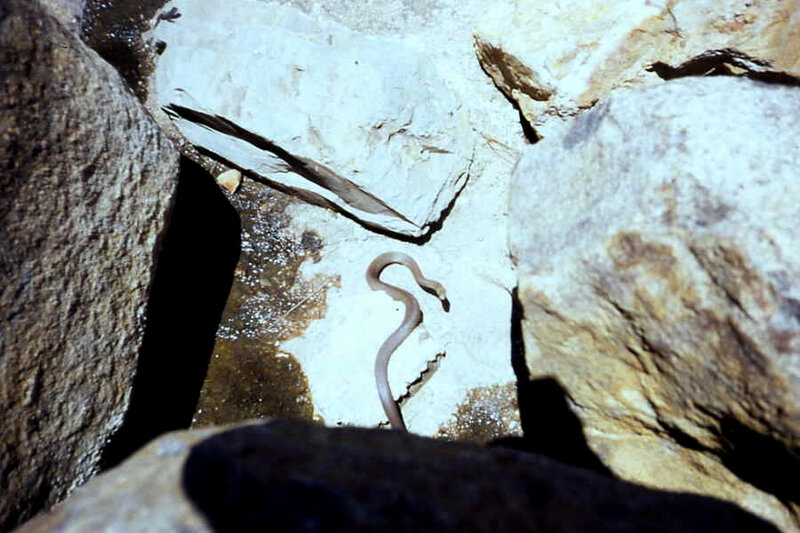 During foraging movements the snake also searched recently excavated dragon nest sites in between periods of basking. Adult dragons seemed to be ignored, perhaps they represent the potential for injury during a predation attempt. Risk of injury outweighs the feeding benefit? Monitor Lizards at Batemans Bay. We had the opportunity to see monitor lizards (Varanus varius) in their natural environment at Marrumarang National Park, near Batemans Bay. 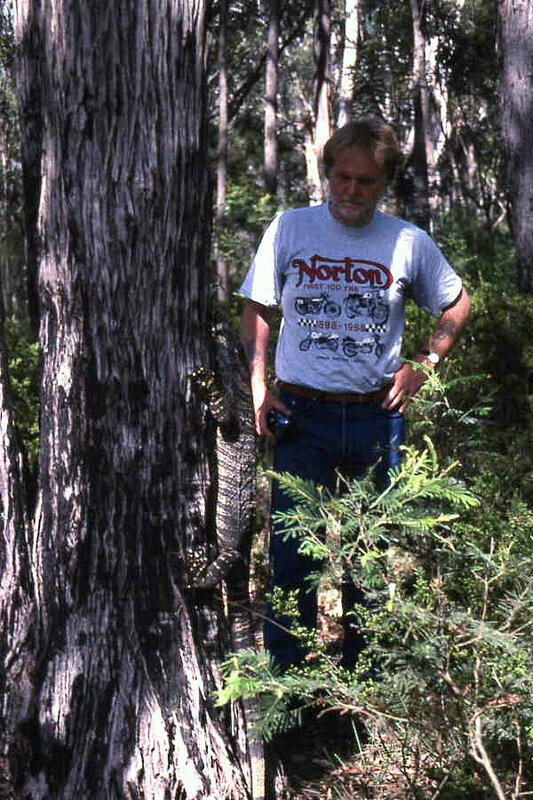 Ross Bennett of the Australian Reptile Centre in Canberra had suggested to us that if we started a barbeque the scent from the cooking would attract the monitors – and indeed it did! After about 20 minutes the first monitor lizard appeared out of the forest (top left photograph) and was the first of several that appeared within the hour. Also shown in the photograph is ex-Glaswegian Charlie Frost (seated on the left) who had driven us to the area. 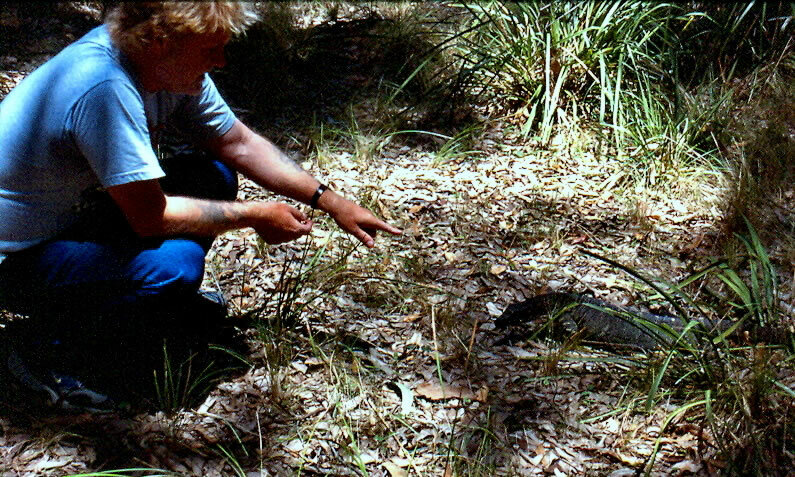 Avril Avery (standing) and myself are observing the approaching lizard. In the next photograph (lower left) I had just fed a sausage to a foraging female monitor, which illustrates how used they are to the presence of humans. Like almost all monitor lizards this species is strictly carnivorous with optimum body temperatures up to around 37˚C. 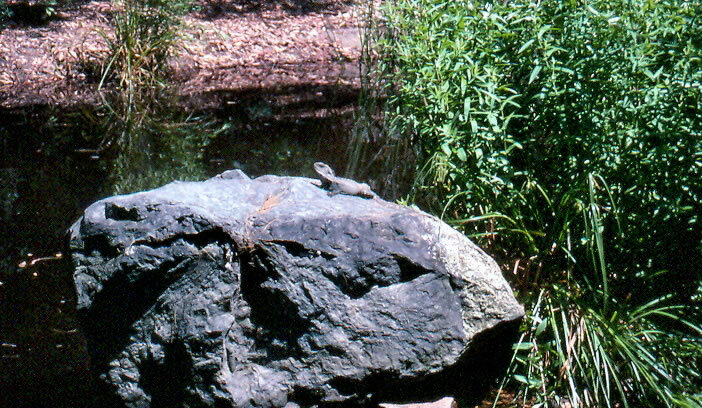 Thermoregulatory theory predicts that when air temperatures in the forest are lower than optimum body temperatures the lizards must interrupt foraging with frequent basking in sunlit patches. For a short period we followed one of the monitors through the forest to see if it behaved in the way predicted. Indeed it did. It foraged for periods of about 10 minutes or so then selected a sunlit patch, basked for about 5 minutes, then resumed foraging. Monitor lizards are the supreme all-rounders of the lizard world. They are able to swim, climb and run very well. A resistance to fatigue and an ability to produce sensible levels of metabolic heat, which exceeds that of other reptiles and even some species of mammal, means that in many respects they differ physiologically from other lizards. An ability to climb trees (which this one was about to in the photograph top right) enables them to search for the nests of birds - most species of monitor seem to like eggs!